cCHANGE uses the Three Spheres Framework to understand and accelerate outcomes for sustainability in a changing climate. Transformation has become an important concept in discussions and debates about how to address complex environmental problems such as climate change. 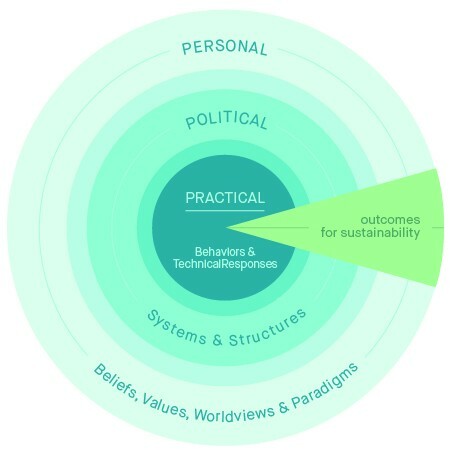 The Three Spheres Framework draws attention to the interacting domains where transformations to sustainability can occur. These domains are referred to as the practical, political and personal spheres of transformation. The practical sphere usually receives the most attention, for this is where progress towards goals can be observed and measured. Within the practical sphere, transformations most often involve enhancing knowledge and expertise, promoting innovation, improving management, and changing behavior. For example, transformations to low-carbon cities may involve lowering CO2 emissions from automobiles and buses, encouraging bicycling or the use of public transport, developing passive housing units that use little energy for heating or cooling, and so on. These are largely “technical responses” that are challenging, but not impossible. Practical transformations can directly contribute to outcomes for sustainability. However, such transformations are often impeded by larger systems and structures that define the conditions for change. These systems and structures fall within the political sphere; it is here where collective action and political processes can challenge the vested interests and power relations that maintain systems and structures intact, or address the inertia associated with systems that may have functioned well in earlier contexts, yet are no longer consistent with outcomes for sustainability. For example, collective action to establish more bike lanes and showering facilities at work may facilitate a larger increase in bicycle transport than appeals to behavioral change. Transformations in the political sphere are strongly influenced by how the system is perceived by different actors and groups. The personal sphere of transformation includes the individual and shared beliefs, values, worldviews and paradigms that influence attitudes and actions. These shape individual and collective “views” of the systems, which can often explain preferred strategies for practical transformations. Transformations in this sphere can be powerful because they often lead to new perspectives on human-environment relationships. For example, transformations to worldviews that value other species, other humans, and future generations are more likely to support systems that are consistent with their well-being, and identify practical transformations that are inclusive rather than exclusive. The three spheres interact in non-linear ways, and transformations within any one sphere can facilitate changes in the others. However, it is possible to identify leverage points that accelerate transformations to sustainability. Working with the three spheres of transformation, cCHANGE considers the important leverage points that contribute to creative change, collaborative change, and conscious change. IPCC (2014) Chapter 20: Climate-resilient pathways: adaptation, mitigation, and sustainable development. In: Climate Change 2014: Impacts, Adaptation, and Vulnerability. Part A: Global and Sectoral Aspects. Contribution of Working Group II to the Fifth Assessment Report of the Intergovernmental Panel on Climate Change. Cambridge University Press, Cambridge, United Kingdom and New York, NY, USA, pp. 1122.